Bill Nelson needed a machine error to have a chance in Florida. He didn't get it. As the statewide hand recount chugs along, Rick Scott moves closer to victory. FORT LAUDERDALE, Fla. — It was the ballots, not the machines. To have a chance at overcoming Gov. Rick Scott's 12,603-vote lead in their Senate race, incumbent Bill Nelson, D-Fla., desperately needed a manual statewide recount to show that tens of thousands of votes here in Democrat-heavy Broward County had been misread by scanners. That didn't happen. And Nelson's chances of holding his Senate seat went from very slim to virtually nonexistent. "I don't see a path," said Steve Schale, a veteran Democratic strategist based in Florida. "Honestly, the path was never likely, but that doesn't diminish the need for a recount process, if for no other reason but to answer lingering questions — such as the undervotes in Broward, and provide certainty to all involved." 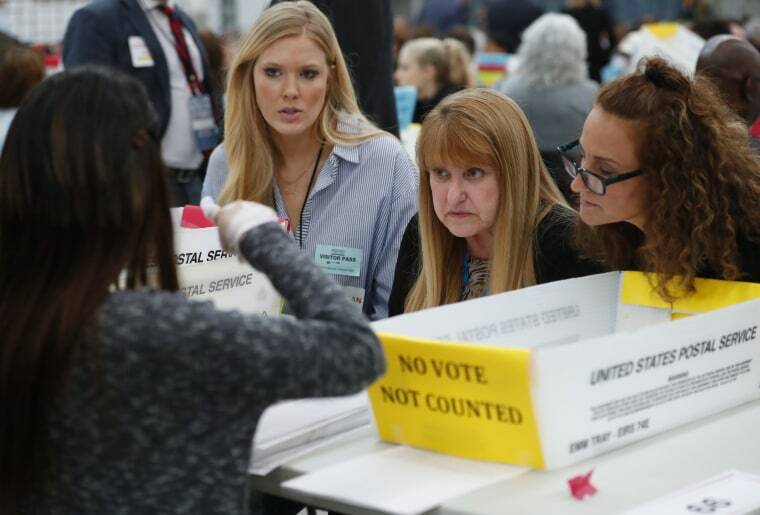 The deadline for counties to finish their hand recounts is Sunday at noon, but Broward was the mother lode of "undervotes" — roughly 30,000 ballots for which the machines couldn't read a vote in the Senate race. The Nelson team's theory — or its hope — was that voters had indicated a preference on most of the ballots but that the machines could not pick it up. Instead, it appears that most of the voters in question simply skipped that race, possibly due to its location on the ballot rather than lack of interest in the outcome. The governor's race, where Democrat Andrew Gillum trailed Republican Ron DeSantis by nearly 34,000 votes after a machine recount, was not close enough to mandate a hand recount. Florida election officials are still conducting recounts in down-ballot races, and the results are expected to be announced after the Sunday deadline for reporting. They are due to be certified by the state election canvassing commission on Tuesday.